According to the official Warner Bros. release kicking off the 75th anniversary of Batman, he debuted (via Detective Comics #27) on March 30, 1939. In 1989, coinciding with Tim Burton’s Batman, Bob Kane’s autobiography came out. But as with most of the output Bob’s name is on, he did not create it alone. His co-author was Thomas Andrae, who through my Bill Finger research became a friend. Though I’ve known for a while how important Tom is to Bill’s legacy, given what he’d told me about how he’d persuaded Bob to include Bill in the book as much as possible, I only recently realized that this story-behind-the-story should be documented. In my eyes, what Tom did on Bill’s behalf was heroic. Interview answers © Thomas Andrae 2014. 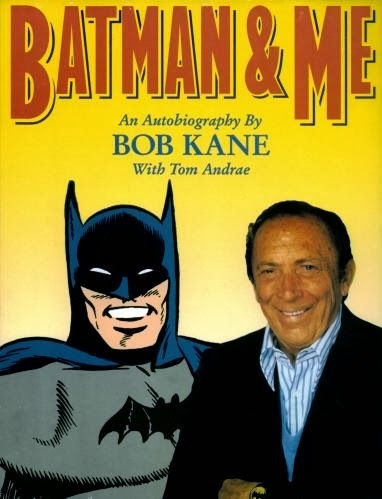 How did you come to co-author Bob Kane’s autobiography Batman & Me? I had done an interview with Jerry Siegel and Joe Shuster in 1981. It was reprinted in the Overstreet Price Guide in 1988, in celebration of Superman’s fiftieth anniversary. I thought it might be a good idea to follow this up with an interview with Bob Kane for Batman’s fiftieth anniversary in the 1989 Price Guide, so I contacted Bob and he was amenable to the project. When I went down to interview Bob, he told me that he had written his autobiography. [It was] a very long manuscript (about 800 pages) that wasn’t publishable. It was too self-centered according to those of us who read it. There were far too many uses of “I” in it, for example. [But] I...thought, in the interest of comics history, the manuscript should be published, [so I] offered to find a publisher. What was your job/primary work focus at the time? I was a graduate student and working for Bruce Hamilton at Another Rainbow Publishing as an editor of the Carl Barks Library 30-volume set of his works. Had you met Bob before you began the book? This was the first time I contacted him. What was your first impression of Bob? He was a very charming guy and quite friendly. Bruce Hamilton and I went down to L.A. together to meet him. After the inteview, we went out to dinner with him and his wife Elizabeth. Did you meet with him in person to discuss/write the book? If so, how often and where? If not, how did you work together? I didn’t meet with him again in person. 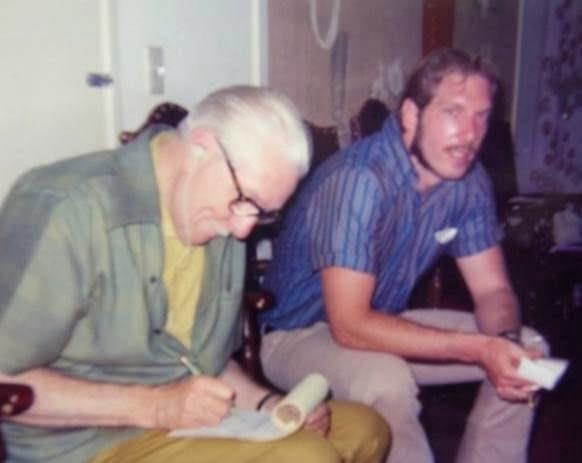 We had many phone discussions and some correspondence for about a year or more while working on the book and when we were producing and marketing it. In this period I got to know Bob quite well, and he seemed fairly open about his life, up to a point. I felt that we were friends. I edited [the book], took out some chapters, and created a number of new chapters based on interviews with him and on my own research. All in all I probably wrote close to half the book in this manner. Did your impression of him change during the process? Yes. He had a tremendous ego, although he was very insecure. I asked for a byline and got one. He pretty much had to do this: I was supposed to get the manuscript into publishable shape—which was quite a task. I was responsible for not only rewriting the book but for advertising it, formatting it, and getting a publisher for it. But he told the publisher that my byline was too big so they reduced its size. From what I gather from others who had worked with Bob, I think that I was lucky to receive a byline at all. It may have been a first. Pretty easy, but he could be temperamental. 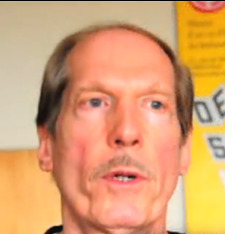 When Bob Overstreet decided to go with a Jerry Robinson cover rather than one by Bob, [Bob] threatened to nix the publication of the interview. I convinced him otherwise, because we were taking orders for the book in an ad in the Price Guide and it would have sabotaged the book project to kill printing the interview. No one wanted to publish his bio until I asked Eclipse to do it. I got the idea to take out a pre-publication ad for the book that appeared in the 1989 Price Guide. We received 1,500 orders; that proved it was a viable project and helped get a publisher for it. I did all the work in this initial stage of order-taking. Do you remember how the subject of Bill Finger first came up during the process? Yes. Bob felt guilty about how he had treated Bill, although he was afraid to acknowledge Bill as co-creator of Batman, or to give him a byline, for fear it might open the door to a challenge to Bob’s legal status as the sole creator of Batman. He feared a [Finger] byline would quite negatively impact his Batman royalties. What was Bob’s reaction when you suggested including Bill? It was Bob’s idea to give Bill some credit for having invented aspects of the costume and for creating the Joker. But Bob also claimed he co-created many of the villains since he, Bill, and Jerry discussed everything before it was published and Bob drew the art for the stories with the characters. But Bob was mistaken about who created what, such as the Penquin or Catwoman, which were Bill’s creations, and Jerry did much of the art as well, with Bob and sometimes without him. In general, Bob failed to give Bill credit for creating most of Batman’s villains, claiming that he created them. Bob’s memory was not very good. Also, he was willing to go only so far in giving Bill credit. I tried to add more about Bill’s contributions in creating the initial concept and image of Batman, but Bob refused to include them, claiming that he, not Bill, was the creator of Batman, which was a gross exaggeration. Did Bob express—or did you glean—his personal feeling about Bill Finger? I think he liked Bill and genuinely felt guilty about how he had treated him and how Bill ended up in near poverty when he died. Bob confessed that his ego prevented him from giving Bill the credit he deserved. But his attempt to remedy this was, in my mind, quite, quite inadequate. Also, he never gave others, like Shelly Moldoff, who was his ghost artist for twenty years, any credit, nor Jerry Robinson for his creation of the Joker. Bob expressed a lot of anger towards Jerry, stemming, I think, from being jealous of him, of his artistic ability, and of the recognition that he had received. When you say “Bob confessed that his ego prevented him from giving Bill the credit he deserved,” what do you mean exactly—that Bob was willing to say in print that Bill’s name deserves to be on Batman (as the book does) but not go so far as to ask DC to officially change the credit line? I think he meant that he should have put Bill’s name on the Batman strip when it appeared. But the point is moot because I don’t think he would ever put Bill’s name on Batman. He never gave byline credit to any of his ghosts. What do you remember about the passage that stands out most to me: “Now that my long-time friend and collaborator is gone, I must admit that Bill never received the fame and recognition he deserved. He was an unsung hero ... I often tell my wife, if I could go back fifteen years, before he died, I would like to say ‘I’ll put your name on it now. You deserve it.’” How did Bob feel to include that—nervous? Conflicted? Redeemed? Other? I believe that Bob sincerely felt some remorse about how he had treated Bill. He describes his spiritual conversion in Batman & Me. But Bob never felt guilty enough, in my estimation, or realized the full extent of Bill’s contribution. Bob was asked to give Bill credit as co-creator by the Finger estate when the first Batman feature film was in production and he declined. Have you seen my account of this? If so, do you remember any other details that I didn’t cover? I’m reporting what Bob told me about his decision in a conversation with him. I don’t think you covered this. How did you feel convincing Bob to include more Bill? I felt that it was a slight victory in correcting a massive injustice, but too little too late. Did you talk with Bob’s wife Elizabeth during the process? If so, how was that/she? She was a very nice, sweet person, but knew little about Bob’s work, so we didn’t talk about the book. Do you know what her reaction was when Bob would tell her that he felt Bill deserved credit for Batman? Perhaps first I should ask if you believe he actually did tell her that? Yes, he did, but I don’t know what her reaction was. Do you remember if you asked Bob if he would consider recasting his contract with DC Comics to reflect his statement about Bill? If so, what was his response? He was not amenable to this and told me so. How honest do you feel Bob was in recounting stories? I think he was fairly honest but too self-centered to see reality clearly enough and had a bad memory to boot. His ego was always in the way. He primarily remembered what he did on Batman—and that was usually inflated—rather than others’ contributions. I constantly had to fact-check what he told me because he had a predisposition to aggrandize his work on Batman. What was the media response to the book? We got some favorable media attention, but not going on The Tonight Show like Bob thought would happen. What was Bob’s feeling about the final product? Do you think it got the recognition he wanted? Do you think he did not get anything he wanted from it? Professionally, what did the book do for your career? Nothing in academia but I got some credibility among fans and the popular press. Is there anything about the book you would now change if you could? Give full credit to Bill as Batman’s co-creator and give him a byline indicating that, and give full credit to Jerry Robinson and the other artists who did much of the work that Bob got credit for. I would have liked Bob to publicly acknowledge Jerry as the Joker’s creator and Shelly Moldoff as the chief artist on Batman for the decades that he drew the strip. Were you involved with the “sequel,” Batman & Me: The Saga Continues? If so, how was that process compared to working on the first autobiography? Yes. I edited most of the new material; Bob took my name off the cover (though it’s still on the title page). What do you think Bob Kane’s legacy is? I think that Bob was responsible for creating the original germ of the idea of a Batman superhero, which Bill fleshed out and made viable, and for partially drawing the strip for a number of years. I think that Bob’s art, crude as it was, gave the strip an Expressionistic, nightmarish look which helped establish the gothic ambiance of the early stories. To me, the art he did with Jerry as his ghost was very compelling. Thus he made a great contribution to Batman’s legacy. Unfortunately his treatment of Bill, Jerry, and Shelly is a dishonorable part of that legacy. Thanks for giving me the opportunity to talk about my role in creating the book. This is the first time I’ve done so publicly. Tom is the best. Can't say his name enough when it comes to the entire practice of looking at comics creators seriously. Good to hear his take on this still-important book. I still see people selling the deluxe version at cons. Tom did a lot of groundbreaking research in to a number of comics creators which should be examined by more "serious" comics scholars than has been to date. I fondly remember most of our dealings back when I had comic book stores on Telegraph Ave near UC-Berkeley and Tom was working at UC-B. That Tom was able to get Bob Kane to budge as much as he did regarding the travesty of hiding Bill Finger's contribs is a testament to Tom's tenacity uncovering and presenting truth.